The Queen's brooch is a gift from the Captain and Officers of HMS Ocean. 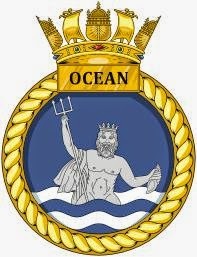 Its design is derived from the ship's badge, and depicts Oceanus rising from the waves brandishing a trident. The brooch was designed and made by Harriet Kelsall Bespoke Jewellery, who chose elements from the ship's badge to create a wearable brooch. The rope detail outlines the bottom of the brooch, with three tridents raising up from the waves. 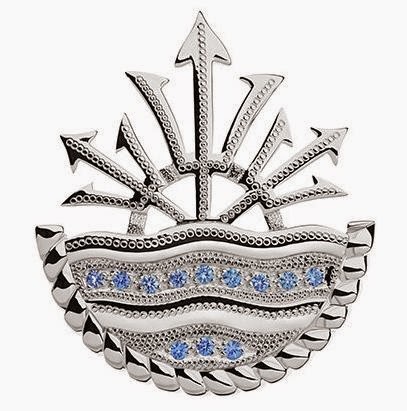 Consultation from the ship's officers was taken into account along the way, resulting in a brooch made of bright polished sterling silver with sapphires pave set into the waves and intricate detailing to make it come alive. The piece was handmade by the HK Bespoke Jewellery team in Hertfordshire. This is a nicely stylized interpretation, and no doubt a gift appreciated by The Queen, who has made several visits to the ship since its initial dedication and is kept up to date on its activities. Thank you to HK Bespoke Jewellery for sharing the story behind this brooch, and to A Petite Princess for calling attention to it! You can read more about the design and creation process at the HK site, and APP has a post about the brooch too.